and the Associated Builders and Contractors. With the increase in competition and changes in the workplace, the key to good management practices now requires a clear understanding of human behavior. Through this program managers will learn their own behavior style while they also receive a picture of the style of the people they have to manage. This information will allow them to better relate to and motivate their subordinates and is also valuable in team building, hiring, and the correct placement of personnel. "Thank you for being our keynote speaker. Your presentation was enjoyed thoroughly by our members and I am receiving many evaluations saying "best yet", and "keep speakers like that coming". Thank you so much for bringing the great tips on high energy and sales success." This is a fast-moving training program designed to increase productivity and promote teambuilding by helping your people learn more about their own and each others' overall goals and work styles. They'll discover practical strategies that foster cooperation in both the business environment and their personal lives. And they'll learn how people with different work styles can resolve incompatibilities and interact more effectively as a team. People call it the art of persuasion, but is it really an art? Or are there actually systematic approaches which can be used to better understand our own motivation and that of those you are trying to persuade? The session explores this question and offers participants a proven way to read their clients' behavior styles, which enables them to be even more successful persuaders. This is a fast-moving training program designed to increase productivity and promote teambuilding by helping your people learn more about their own and others' work styles and overall goals. They'll discover practical strategies that foster cooperation in both the business environment and their personal lives. And they'll learn how people with different work styles can resolve incompatibilities and interact more effectively as a team. "Friday's event was a wonderful success due, in large, part to your talent for educating the masses in a most delightful manner! The information you shared was a real eye opener!" the stress of change more productively and effectively. 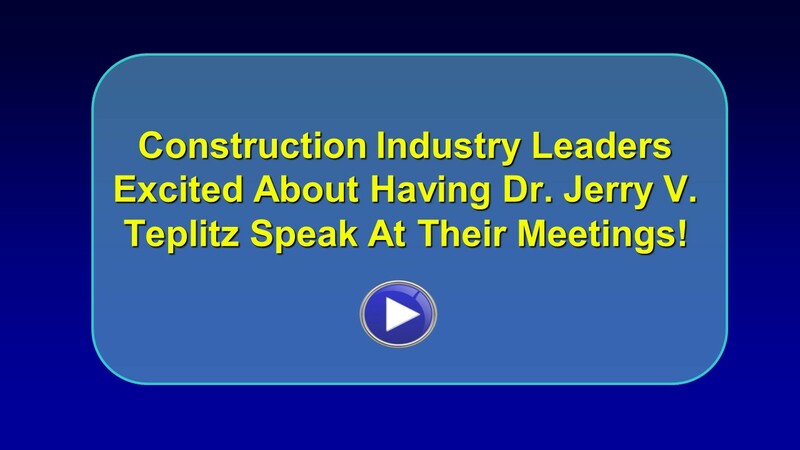 "You certainly wowed our members at AGC's 2009 Convention in San Diego with your program Increasing Your Personal and Professional Power to New Levels of Excellence. Since our CEO, Stephen Sandher heard you speak at the NW AGC Chapter Executives Conference, I was confident about your abilities. Well, you went even further than I thought with 100% of the attendees rating your program either Excellent or Good. As a matter of fact 67% said Excellent and 33% said good." 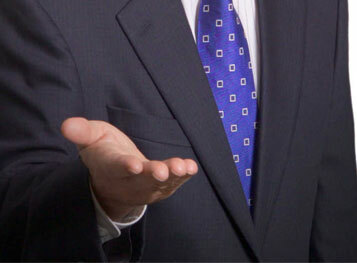 "Your four sessions were very popular and our members are still talking about your presentations. Your unique message and practical application gets people what they want....immediate results. I hope more ABC chapters take advantage of your program." "Thank you for being our keynote speaker. Your presentation was enjoyed thoroughly by our members and I am receiving many evaluations saying 'best yet', and 'keep speakers like that coming'. Thank you so much for bringing the great tips on high energy and sales success." "What a great addition you were to our Northwest AGC Chapter Executives Conference! You got them involved and really held their attention as you delivered your program on Increasing Your Leadership Power to New Levels of Excellence. Best of all, they were still talking about your session through the rest of the meeting. I would highly recommend you to any group that wants exciting new information presented in a way that captures the audience from start to finish." "I just want to tell you what a great job you did for our ABC Keystone Chapter. You after dinner program on Managing the Stress of Change got rave reviews by all in attendance. Even though your program was several months ago, members are still talking about it. That's a rarity after a program." 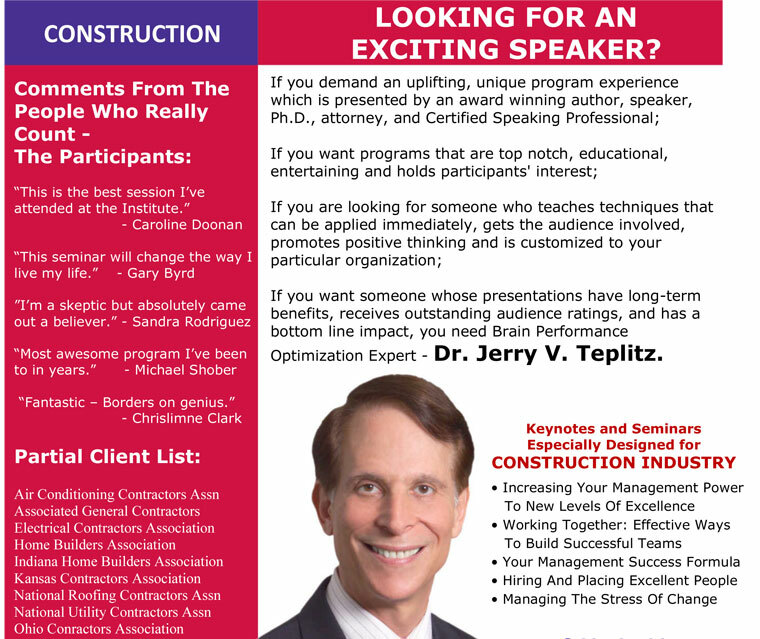 ABC Keystone Chapter, Associated Builders and Contractors, Inc.
�You did several great programs at our annual convention on Increasing Your Management Power to New Levels of Excellence and Speeding to Effective Time Mastery: Working Smarter Not Harder. You took a group of skeptics and in short order turned them into believers. Our people were both amazed and excited about what you were teaching them. Let me give you an example from the evaluation forms from the Increasing Your Management Power program that participants completed. We were very, very pleased to see that 75% rated your session Excellent and 23% rated it Good for a total of 98%. In addition, 98% also would like to have you talk to them again. "This is the best session I've attended at the Leadership Institute." "I honestly think this seminar will change the way I live my life. I can't wait to share his teachings with everyone I know." "I'm a skeptic but absolutely came out a believer." "I would not have believed it unless I was there." "Amazing, so much we don't know about the mind/body."